The Izu Thrush (Turdus celaenops), also known as the Izu Islands Thrush, is a thrush native to the Izu and Ryukyu Islands of Japan, in particular, Hachijojima, Mikurajima, and Miyakejima in the former chain, and Yakushima and the Tokara Islands in the latter. This species is absent from the main islands of Japan. 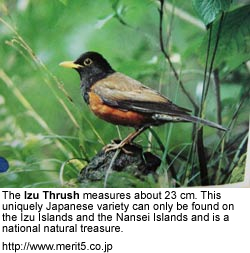 The Izu Thrush measures of approximately 23 cm in length. The Izu Thrush has a distinctive dark plumage, with a black head and tail contrasting with yellow eye-ring and bill, chestnut brown wings, and a rust-red belly.